"A delicious twist to the traditional apple pie! Wonderful when served warm with vanilla ice cream." In a large saucepan, whisk together white sugar, 1/4 cup flour, and salt. Stir in cranberries and maple syrup. Cook over medium-high heat, stirring constantly. When mixture comes to a boil, reduce heat, cover, and simmer 5 minutes, stirring occasionally. Stir apples into simmering mixture, and continue to cook for 5 minutes, or until apples are tender. Remove from heat, and stir in walnuts. Set aside and allow to cool to room temperature. In a medium bowl, combine breadcrumbs, 3/4 cup flour, brown sugar, and melted butter. Mix well. 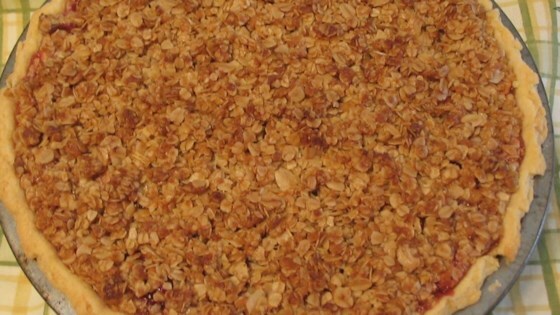 Pour cooled apple mixture into pie shell and sprinkle crumb topping over apple filling. Bake in preheated oven until topping is golden brown and filling is bubbly, about 30 minutes. Serve warm. Very good, although a little time consuming. Makes the house smell fantastic!